5 WEEKS UNTIL TROY Series SA 2019 FOR TRIAL KICKS OFF AT VICTOR HARBOR! You are here: Home / News / 5 WEEKS UNTIL TROY Series SA 2019 FOR TRIAL KICKS OFF AT VICTOR HARBOR! 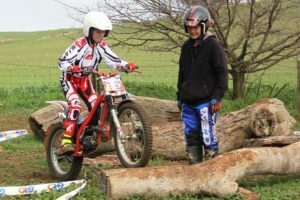 5 weeks until the 2019 Trials SA trials season kicks into gear with one of the iconic events of each year, the Frank Tuck Trial, to be run by the AJS MTC at Victor Harbor – which is also round 1 of TROY Series SA 2019. 2019 will see ‘TROY’ celebrate 10 years as a Series, and for the 10th year it will b a 5 round Series, with 4 clubs sharing hosting duties, AJS, Gawler, Keyneton & Velocette, with the last 2 clubs rejoining the series after a few years of not running a round of the series – and Trials SA welcome them back! Rounds will be held at some of SA’s finest trials venues, and with free entry for spectators and catering at most events, it will be a great family day out to watch what is, the number 1 family friendly discipline of motorcycling! It means that riders from Australian representatives and Champions, to brand newbies will all be riding at the same time, making it a great spectacle for spectators and people wondering if they should start riding or not – it is a sport for all ages and abilities! # Trials SA offer a non-competitive class at all events – and for all ages, and age of bike! Riders get a discounted entry as they are not riding for a placing, but get to enjoy a days riding within a great community – and it is for ages 4 to 74 – with Mini Trial being a great entry into the sport – and is open to riders 4 to 9 years of age, and on small wheeled bikes with automatic gearboxes, petrol or electirc! And don’t forget to put this on your calendar – 2019 SA Trial Championships @ Magic Mungeree – it will be, as always, an ‘event of the year’ and with SA Championship status for the first time since 2011!